Open 11:30am-2:30, 5-8:30pm (LO) daily. Having conquered the worlds of music and fashion, "A Bathing Ape" founder Nigo has turned his attention to curry rice. 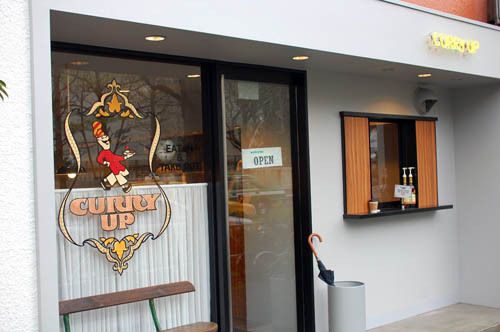 The small Curry Up shop on the northern edge of Harajuku was designed by Wonderwall and reportedly named by hiphop producer Pharrell Williams. The look is simple but stylish - a white concrete storefront with a yellow neon sign, and lots of stainless steel and concrete on the interior. The modern style is tempered by subtly kitsch elements like the faux-wood-grained table and counter tops, old-fashioned white curtains in the window, and the gold-bordered shop logo with a smiling, mustachioed chef. The music is old-school, mainstream reggae - we enjoyed both "You Don't Love Me (No No No)" by Dawn Penn and "One Love" by Bob Marley during our first ten minutes in the shop. The high point of our meal (from a design point of view) was the little dish of pickles that came with our curry. They've taken the vivid pink, green and white curry-shop standard pickle assortment, diced everything up very fine and mixed it all together in a pretty, bright swirl of colors.